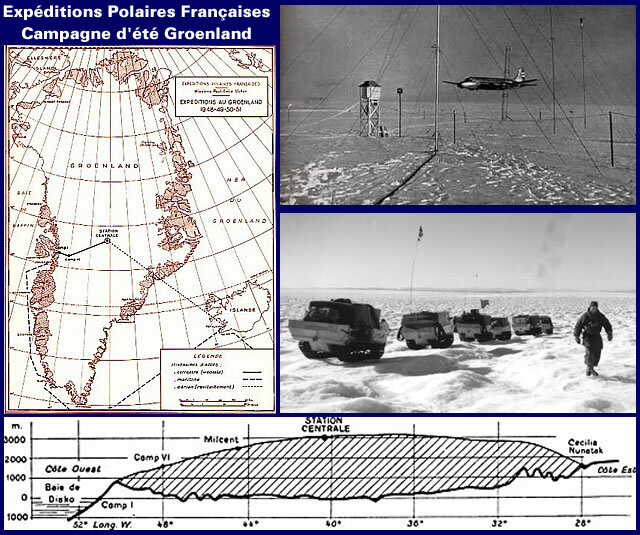 In the second half of the 20th century the Greenland Ice Sheet started to reveal some of her deep secrets when Expeditions Polaires Francaise bored two holes to 126 and 150 metres at Camp VI and Station Central during 1950 and 1951. 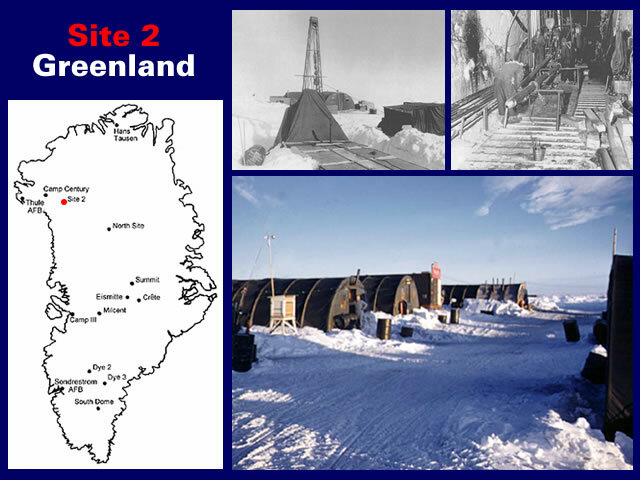 During 1956-57 the U.S. Army Snow, Ice and Permafrost Research Establishment [SIPRE] recovered the first deep ice cores that were suitable for stratigraphic analysis from Site 2 in Greenland as part of the international International Geophysical Year project. Modern ice core drilling technology and the following ice core science studies were initiated by the U.S. Army Corps of Engineers in the early 1950s, just before the International Geophysical Year (IGY) program began, under the formulation and leadership of Henri Bader, Chief Scientist of the U.S. Army Snow, Ice and Permafrost Research Establishment (SIPRE), in association with his research Branch Chiefs, B. Lyle Hansen, James A. Bender, W. Keith Boyd, Robert W. Gerdel, and William H. Parrott, and others. 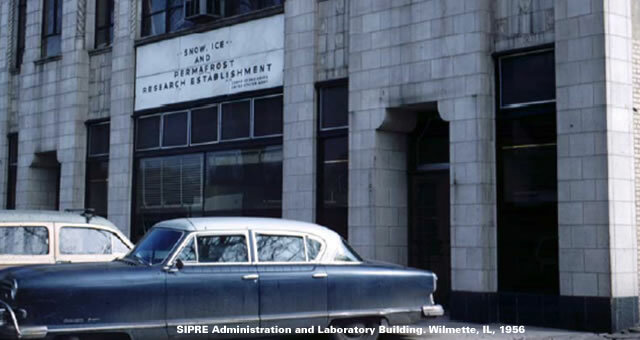 During 1956-1959, the full span of the IGY’s field work, SIPRE successfully recovered the first deep ice cores ever obtained, and suitable for integrated scientific study, from both the inland regions of the Greenland and Antarctic ice sheets. The drilling at Site 2 during 1957 reached a depth of 411 metres. A deep rotary core drilling project in 1957 at Site 2 on the Greenland ice sheet (76° 59´N, 56° 04´W) provided ice core to a depth of 411 m.
The vertical variation in bulk density, macroscopic structure, oxygen isotope ratios, iconic constituents, and extraterrestrial dust (black spherules) were analyzed using both field and laboratory techniques. These data permit the direct estimate of annual accumulation layers in the core. Continuous stratigraphic measurements and observations were made over the upper 100 m of the profile and detailed physical and chemical analyses were made on continuous 1.3 to 3.9 – m core increments at 100, 200, 300, and 411 – m depths. The average total ionic concentration in the ice sheet ranges between 0.65 and 1.35 mg/liter. The annual global mass deposit of black spherules as calculated from these studies varies from 2.10 x 105 metric tons in 700 year old ice to 6.57 x 105 metric tons in 12 year old firn. The oxygen isotope ratio variation provides the best means of estimating accumulation at depth. 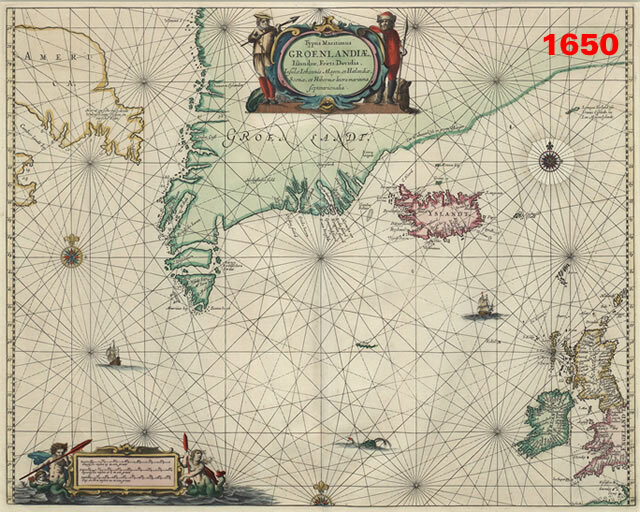 Results of the investigations indicate rates of net snow accumulation of 42.3, 34.2, 37.4, 41.1 and 41.6 g/cm2 – yr at the surface, A. D. c. 1773, c. 1513, c. 1233 and c. 934, respectively. Accumulation data and other physical and chemical evidence allow climatological inferences to be made over the 10-century profile. The ice core record shows that snow accumulation and temperature in A. D. 934 were similar to today, followed by a gradual decrease in accumulation to a minimum around the late 18th century and an increase in both accumulation and temperature from A. D. 1773 to 1957 and following. US Army Cold Regions Research & Engineering Laboratory, Hanover, New Hampshire. The Site 2 report published ten years later  is a fascinating read due to its open approach, holistic scope and attention to detail. For example, the Site 2 analysis clearly identified a close-off or zero permeability zone at a mean depth of 71 metres at an average density of 0.828 g/cm3 where firn becomes glacier ice due to “vertical plastic deformation”. However, a curious aspect of the reported Site 2 stratigraphy is that the neat and tidy detailed sampling series [based upon increments of 100 metres] jumps over the final 400 metre strata and terminates at 411 metres. This jump to 411 metres is even more curious because it is dated to 934 AD which is exactly 700 years [i.e. Gunnar Heinsohn’s Phantom Years] after the destruction of the aqueducts in Rome in 234 AD that was caused by a “worldwide catastrophe” according to Ewald Ernst. I am convinced that Gunnar Heinsohn is working on a view of the 1st millennium CE that will not only revolutionize Roman history but also our understanding of the Christian world of the post-1000 CE Middle Ages. At the core we have a worldwide catastrophe, and some 700 years of phantom-time between 234 and 934 (Heinsohn prefers a somewhat less specific dating from 230s to 930s). In reality, the destruction of the aqueducts happened swiftly, and with a power no humans had at their disposal. This happened, in 234 CE, only eight years after the last system had been completed under Alexander Severus in 226 CE. This jump to 411 metres and 934 AD is roughly aligned with a very curious layer of “poorly sorted grey-brown sands and silts with scattered stones” at Garðar/Igaliku [Greenland] which was laid down before 875 ± 35 BP [1075 AD ± 35 years]. 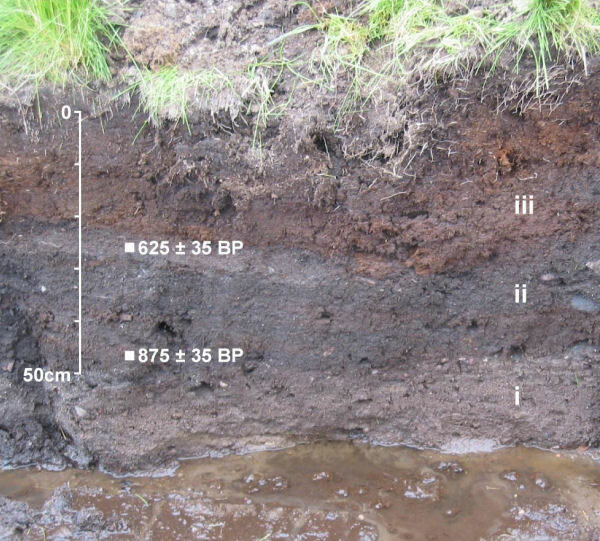 Ditch section at Garðar/Igaliku showing poorly sorted grey-brown sands and silts with scattered stones (i) overlain by a dark brown humified and clay-rich peat containing abundant cultural material (a plaggen soil) (ii), and sealed by brown fibrous peat lacking in artefactual debris (iii). Calibration of AMS radiocarbon dates on Montia fontana seeds using Calib Rev 5.0 produces 2σ ranges of cal AD 1040-1250 (lower sample) and cal AD 1290-1400 (upper sample). Therefore, the Site 2 ice core immediately above 411 metres [934 AD] should provide clear support for Ewald Ernst’s “worldwide catastrophe” of 234 AD and Gunnar Heinsohn’s Phantom Years. However, this is where another curious thing happens in the reported Site 2 stratigraphy. Apparently, only two 5 metre lengths of ice core were recovered below 305 meters [from 360 metres and 411 metres]. Therefore, Site 2 does not provide support for the Phantom Years hypothesis because there is only Phantom Ice Core between 360 and 406 metres. Ironically, immediately after detailing the 106 metres of Phantom Ice Core the paper boasts that “core quality has improved considerably in 1957”. Such is the fickle nature of glaciology. Regardless of these sampling problems, it was a remarkable technical achievement to extract an ice core from the Greenland Ice Sheet down to 411 meters. More importantly, the Site 2 ice core provided science with its first glimpse inside the Greenland Ice Sheet and furnished scientists with a real world profile that could be projected [back in time] down to sea level. Very surprisingly, the projections indicate the Greenland Ice Sheet is somewhere between 1,500 and 4,500 years old at Site 2 in North West Greenland. A 3rd order polynomial trend line [with an R2 = 1] points towards 3,000 years old. It is important to remember that all of these Site 2 projections conform to the gradualist doctrine that states: “the present is the key to the past”. Uniformitarianism is the assumption that the same natural laws and processes that operate in the universe now have always operated in the universe in the past and apply everywhere in the universe. It has included the gradualistic concept that “the present is the key to the past” and is functioning at the same rates. These very modest gradualist projections [ranging from 1,500 to 4,500 years old] indicate it is not beyond the bounds of possibility that the growth of the Greenland Ice Sheet was triggered by a “worldwide catastrophe” in 234 AD as proposed by Ewald Ernst. In this context it is important to remember that at Site 2 the “reasonable interpretation of physical stratigraphy ends just below 100 m” [circa 1773 AD] and that the dating of the ice core below this depth was achieved via mathematical modelling. Therefore, the results from Site 2 do not preclude Gunnar Heinsohn’s chronology [which includes 700 Phantom Years] based upon a worldwide catastrophe occurring in the 930s AD because “reasonable interpretation” of the Site 2 ice core terminated just below 100 metres [circa 1773 AD]. Fundamentally, ice core chronologies reflect where the chronicler draws the line between “reasonable interpretation” and their preferred mathematical model. Either way, these 1957 results suggest the Greenland Ice Sheet at Site 2 is very significantly younger than the headline 110,000 years promoted by Wikipedia. Gallery | This entry was posted in Catastrophism, Glaciology, Great Greenland Snow Job, Greenland, Heinsohn Horizon, Uniformitarianism. Bookmark the permalink. And if we consider Gerry Pollack’s work, then ice layering defined by solute poor and solute rich layers might be due to the expulsion of solutes from the ice crystal lattice formation, rather than chronological layering.